The Choice activity allows instructors to ask one question - similar to a quick poll. For instructions on how to add a choice activity, visit Moodle 3 Activities and Resources: Add a Choice. The General settings allow instructors to designate a title for the Choice activity, provide a description or instructions, and choose to display the options either horizontally or vertically. 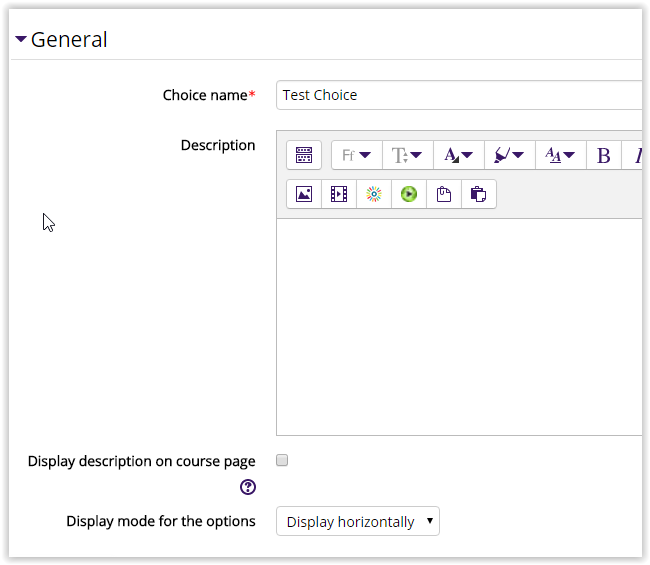 In the Options menu, instructors can choose to allow students to update their selection, allow more than one option to be selected, and to limit the number of responses for each option. 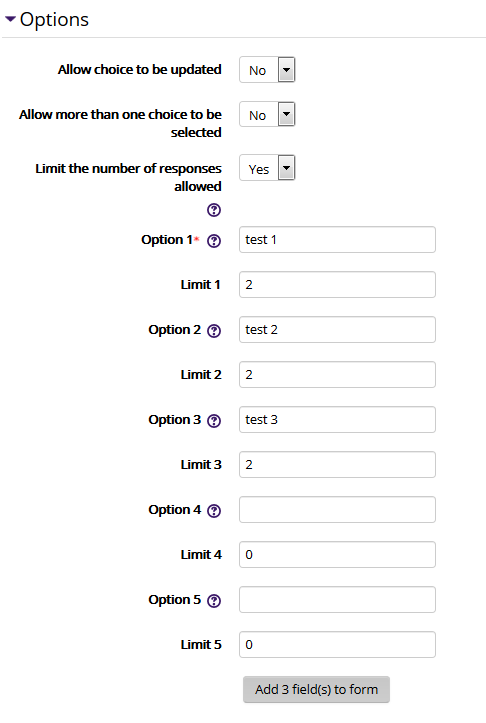 For example, if the limit is allowed (set to 'Yes'), and the instructor limits it to 2 responses, once the second student has chosen that option, it will disappear from the list for the remaining students. You can add more choices by clicking the button marked Add 3 fields to form. Any unused choice fields will be ignored. The availability specifies the amount of time students have to access and participate in the Choice Activity. If Show preview is selected, students will be able to preview the options before the choice is opened for submission. Note: Moodle uses the 24-hour clock system. Instructors can choose to allow students to view the results. If this is selected, the instructor can also elect to keep the results private and publish anonymous results. 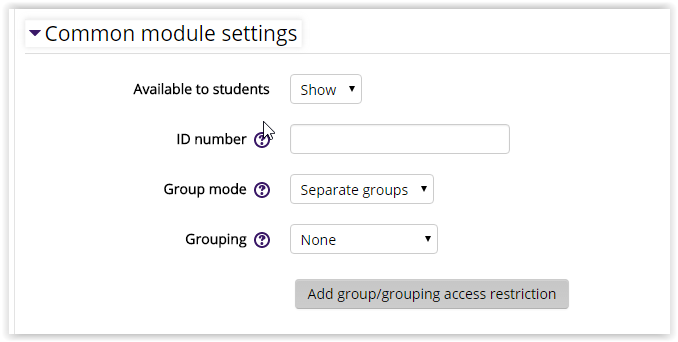 These settings specify the visibility of the assignment for students (Hide/Show), and the group mode and grouping can be designated. NOTE: If the poll activity's purpose is for scheduling meetings or presentations, use NO GROUPS. Using groups will offer the same options to each group, which will result in double-booking a specific time slot. The Choice activity can be restricted based upon a date, group, activity completion of another activity/resource in the course, etc. NOTE: If more than one restriction is added, students must meet EACH of the requirements before the activity becomes available. By default, students can manually mark the Choice Activity as complete, but an instructor can change this to be required. If required, the students can be marked complete by either viewing the activity, or by making a choice.